With a little help from Back in the Pack (who takes amazing indoor daycare pictures), I’m trying out some different settings on my camera to see if I can get better indoor shots of the dogs. With the cold weather, we are outside much less (which means less photo ops) and lots of cute stuff happens inside that we can never share because the pictures never work. So yesterday, I took around 50 pictures and had about 6 half decent ones – if the dogs were moving, it was blurry. So I thought I’d share my first attempts. This is Moxie trying to convince me to throw the ball. Koda is snuggled up at the end of a long day. Jack is also snuggled up at the end of the day. Here is a three way tug with Sandy, Maggie Mae and Ponz. Don’t ever try and play tug with Ponz…you’ll lose. Guarranteed! Kinsey is waiting for Sandy to throw a toy. Despite the cold, the dogs had a blast in the snow…for a few minutes anyway! Gus liked to…um…burrow in the snow. Goofy guy! Sampson liked to eat the snow…. and Taylor just liked to run through the snow! Cuz is the best toy ever – according to Coulee anyway. Once we decided to adopt Lacey we took a trip to the pet store to celebrate and I bought her a “baby cuz” (that is just what we nicknamed it because it is small). To make sure Coulee didn’t get jealous, I bought her a larger “bad cuz”. Coulee LOVES baby cuz. In the mornings, we usually play fetch in the house while we enjoy a coffee. She picks a toy and the action starts. After a while, the toy generally gets a little gross from slobber and no matter how hard we try, we can’t get her to switch toys. We’ll throw balls, stuffies, things with sqeakers and she just looks at us, then back at the “chosen one” and then back at us. Every evening we’ve had to hide baby cuz because the squeaking is driving us crazy. So in the morning, once Coulee is quite settled on her toy, baby cuz appears. She instantly ignores the chosen one and heads straight to baby cuz. Then a morning game of “steal baby cuz” continues until we leave for work. Bad cuz is completely ignored. I think another trip to the pet store is in order. Elvis is a rhodesian ridgeback that has just started coming to daycare. He was a little overwhelmed by all the dogs on his first visit but he is really starting to get into the swing of things. 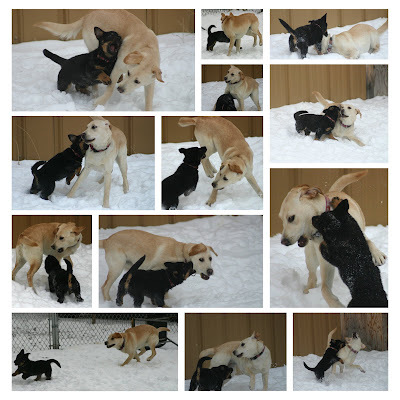 He was having a blast with Dozer (who seems to find a new playmate each visit). You really gotta love those ears! Amanda found someone giving away an old couch for free so we went out and picked it up. As you can tell, it was an instant hit with all the dogs. Kayla is amazing with all the young pups. She loves to play with them. She is the only one who can can not only match their energy levels but go above and beyond them. She tires out all the pups (Ruby, Lacey, Rebox and Maggie) and still wants to keep going. Needless to say, she goes home one tired dog! Moxie and her sister Taylor have started coming to daycare. They were both in our Tricks class last year and they were the smartest pups in class. It is amazing how fast they could learn – it helps that they are border collies and puppies. It really makes me wish I had worked harder with Coulee when she was young. They both live for fetch. Moxie loves to play but she hasn’t quite figured out that she needs to pick it up and bring it back – she leaves that to Taylor. All Moxie does is run with enjoyment after the toy and whine with impatience if you take too long to throw it. Both these photos were taken as they waiting for a toy to be thrown. Hard to believe they aren’t from the same litter isn’t it! It is official. We are going to adopt her! I mean really, could you resist? Is that a big ball or a little dog? Both actually! Lacey might be growing up but she isn’t growing any taller. This is one of my favorite photos of Coulee ever! Thanks Amanda! Scamp paused briefly in her activities to pose for the camera. Maggie Mae was hanging out in her favorite place again – it didn’t matter to her that it was covered in snow. Poor Dozer. He always seems to be the one that other dogs have in their teeth. Today Cassie grabbed on while they were sprinting side by side. Earlier this week it was Kayla that we caught with her mouth around his leg! He doesn’t seem to mind – he always goes back for more!